TRIVIA of Noh : Q14 : Nessun dorma, signore e signori!sun dorma, signore e signori! | Home | Trivia | Q14 : Nessun dorma, signore e signori!sun dorma, signore e signori! Nessun dorma, signore e signori!sun dorma, signore e signori! 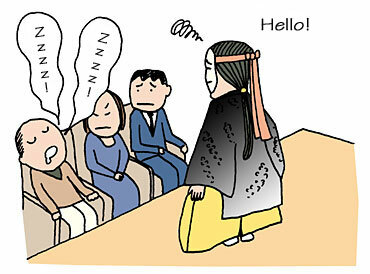 You may experience sleepiness in the theatre, and people sometimes fall asleep watching plays. Some say that if you feel sleepy watching a particular type of play, this is evidence of a good performance; but you should try not to nod off and snore. You should also avoid chewing gum or eating candies to keep awake, because people around you might mind the noise or the smell. Please prepare yourself for the day of the performance and avoid going to the theatre short of sleep.